Hypertherm has announced the release of a new version of its Rotary Tube Pro software that makes it easier to design and cut tube and pipe parts with no 3D CAD experience required. The new update includes a number of new features designed to speed the programming process. For example, automatic nesting is now standard, allowing software users to nest multiple quantities of the same part or different parts on stock tube. Users can add parts to the part list and build a stock list for nesting, maintain the seam orientation during nesting, add part spacing and choose how the software selects stock. Other new features include the ability to store multiple parts and nests, plus an advanced edit feature that allows uses to manually adjust preferences such as the lead size, position and cut sequence. The software also includes features that allow users to pin commonly used lead styles to the top of the list for quick access and offers more powerful reports to better track nests and stock usage. By drawing on years of research and development, Hypertherm software developers were able to deliver optimal outcomes based on factory-tested and proven job parameters including leads, separations, kerf, feed rate and cutting techniques. 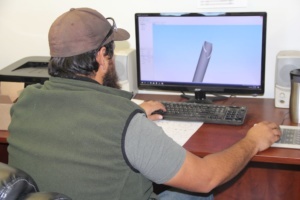 Plasma, laser, waterjet and oxyfuel cutting processes for virtually all brands of tube cutting machines, including stand-alone units and cutting table add-ons, are all supported. In addition, the software supports perpendicular cutting as a standard feature and bevel cutting as an optional module. 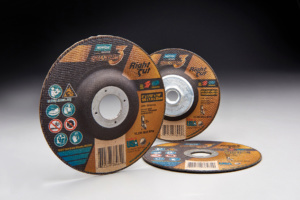 Saint-Gobain Abrasives, one of the world’s largest abrasives manufacturers, has introduced its new Norton QUANTUM3 RightCut Wheels, adding cut-off capability to its Norton QUANTUM3 (NQ3) line, which also includes Depressed Center Grinding Wheels and Combination Wheels. The new Norton Quantum3 RightCut wheels are designed with the operator in mind, with a more rounded grain than precision-shaped ceramic grains found in the market today. Being rounded allows for faster cutting action, with less vibration, which is instrumental in reducing operator fatigue when cutting metal all day. When working on thinner materials, or when operators need to get the job done quickly, the 0.045″ NQ3 RightCut wheel is ideal. Due to the proprietary grain, the wheel cuts through the workpiece quickly, increasing efficiency and saving time. “The bond system of the NQ3 technology allows for better mix control during the manufacturing process. This better mix keeps the individual grains from clumping together, for a more even wear of the cut-off wheel,” said Alicia Castagna Ph.D., Norton |Saint-Gobain Abrasives, Product Manager Thin Wheels. The Norton Quantum3 line of RightCut wheels are offered in four Type 01/41 and three Type 27/42 cutting application SKUs. These wheels are available in 4-1/2″, 5″ and 6″ sizes and are made in the USA. 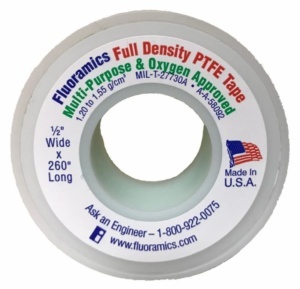 Fluoramics, Inc., a leading manufacturer of thread sealants, lubricants and rust inhibitors, has introduced a line of Premium Full-Density PTFE Tapes that are ideal for sealing large-diameter and high-pressure fittings. The tapes are available in ½” and ¾” widths and are designed to seal fittings up to 6″ in diameter with just two to three wraps of the threads. Approved for use in oxygen service, the highly versatile tapes are green in color and can be used in tandem with Fluoramics’ LOX-8 Paste to handle the toughest thread-sealing challenges, including chlorine, fluorine, anhydrous ammonia, urea, hydrogen sulfide, natural gas, argon, helium, oxygen, and propane. Unlike standard density tapes that are often difficult to apply and prone to shredding, Fluoramics Full-Density PTFE Tapes provide bulk fill that stays in place as it seals large metal and plastic fittings.